Sign up here to get Karen Bentley’s newsletter, your exclusive resource for sugar-free information. You’ll get scientific news, recipes, product recommendations, inspirational stories, updates about upcoming seminars and programs, and anything else that’s relevant and interesting. The newsletter is emailed to subscribers once a month. 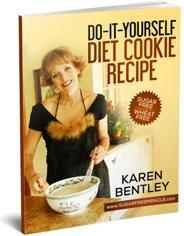 All subscribers get a FREE immediately downloadable copy of Karen Bentley’s The Do-It-Yourself Diet Cookie Recipe, a delicious, crowd-pleasing cookie with big flavor, big hunger prevention and low sugar qualities. No risk of your name or contact information being sold, rented or shared. Just click to unsubscribe. It’s that simple. Sucrose or table sugar is equal parts glucose and fructose. Get caloric sweeteners and wheat out, put fat back in, and eat yourself thin. This program is specifically designed for out-of-control eaters and for people who haven’t been able to sustain weight loss on other programs.